Welcome to the biggest and most versatile 100% FREE fan-made Commander variant! 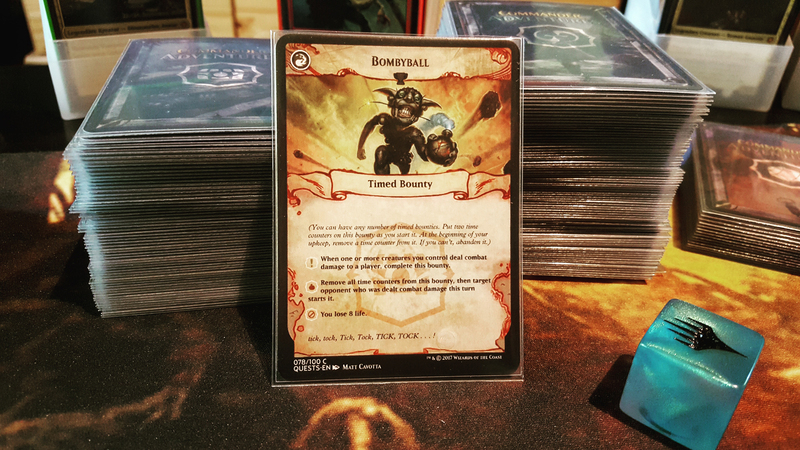 Commander Adventures gives playgroups a whole new take on implementing roleplay elements and fun ways to explore the multiverse of Magic the Gathering through a quest system designed by a team of very dedicated Commander players and judges. ...or becoming an Archenemy, who has powerful scaling abilities to fend off all other players in an epic “One versus All” battle. While progressing through quests, playgroups will face challenging encounters. These encounters resemble self-controlled non-player characters who summon their own minions and use a wide variety of abilities to bring chaos into your games. Some encounters are even so strong that the whole playgroup needs to band together to defeat them. Lastly we also implemented our very own take on very popular variants. Our Conspiracy subvariant makes introducing the "Kingdom / BANG" variant very easy, using extremly flavorful roles from the Conspiracy block. We also just recently added "Vanguard" designed for Commander. 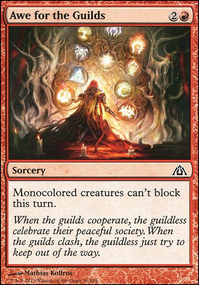 Our Vanguard cards are called Legacies and are heavily influenced by the ten guilds of Ravnica. Each Legacy has powerful mechanics that supplement your strategies in different ways. All our subvariants can be played with or without other Commander Adventures elements and will definetly bring your Commander nights to a whole new level! The best part: You don't require any special decks. Everyone can bring their very own Commander decks to play this variant. Some objectives are designed with certain deck archetypes in mind, and some can be completed by any deck. We put a lot of emphasis on using keyword abilities from throughout all of Magic the Gathering's history. So playing this variant will not only give you the option to visit the multiple worlds of Dominia, but also teach newer players long forgotten mechanics and maybe inspire new themes & tribes to build new Commander decks around! A playgroup never knows what course their games will adopt. There are countless combinations of events that can take place leading to very fun interactions between all players and awesome stories! Upcomming projects are The Bard's Song expansion scheduled for Halloween 2019 as well as an extensive Achievement Point System for your very own Commander League (Yet to be dated) featuring general Achievements and Commander Adventures specific achievements! If you are interested in this variant, make sure to leave a comment and tell us what you think. We're always striving to make this the greatest variant out there! If you want to support this project spread the word at your playgroup and LGS! The idea for Commander Adventures was inspired by Command Zone Podcast #152 and the EDH League Achievement Point System presented by the Professor. This fan project was officially given green light by WotC Support at 12/19/2017 - For Details check Disclaimer! Since we started this project in October 2017 the team around Commander Adventures keeps growing bigger and quite international! Especially to Stefouch and Steeve Fontaine we owe a huge thanks! It took us almost three month to get the wording quality of each card we now have and I couldn't be more proud of the work they delivered. We reviewed every single card hundreds of times to make them judge-proof and also applied the latest Dominaria wording-changes. If you too want to join our design and/or translation team let me know! We also seek to have CA translated into german and any other language we can find good translators for! We are proud to have cardmarket.com as our sponsor who sent us some Coupons for giveaways and stuff! 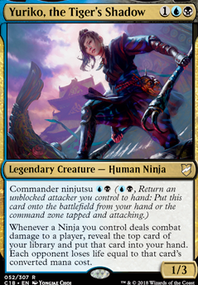 I myself use Cardmarket always to get my latest Commander decks since they not only have the best possible prices worldwide, but also provide great tools like the Wants-List and Shopping Wizard to order everything extremly fast and convenient! Plus you are directly supporting Local Gaming Stores and other private Magic Players like yourself. To play this game you require a planar (or six-sided) die, 4-9 players, each player should have 6-8 twenty-sided dies of the same color and pen & paper to track progress of active objectives. What is a Adventures Card made of? What does a "Game Board" look like? My playgroup isn't able to complete a quest. What should we do? What does "causes the destruction" on Ascension Bounties mean? The wording "causes the destruction" on Ascension Bounties refers to a "butterfly effect" - If your Meren of Clan Nel Toth resurrects a Shriekmaw who kills an opponent creature you'll get a progress counter for your Ascension Quest! - If you use Kess, Dissident Mage to cast Clone Legion from your graveyard cloning Shriekmaw who kills an opponent creature you'll get a progress counter for your Ascension Bounties! Basically: Reading the quest, explains the quest. In case of doubt (e.g. who completed the quest first) check stack rules. I hope that everything is self-explaining and that I don’t overlooked any mistakes – otherwise please report any problems you encounter. If you have any unanswered questions don't hesitate to ask in the comments below or at Twitter / Facebook! Since many players were asking: Yes, you can play Adventures in a Multiplayer Brawl game! 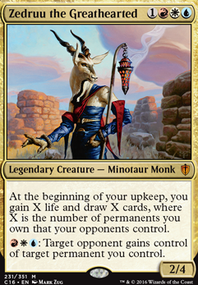 If there is a planeswalker type commander I recommend not to play the "Legacy of the Paruns" expansion since we haven't added Planeswalker specific legacies yet! Everything else works the same as in a Commander Adventures game. Remember to remove any colored quest or bounty cards of the colors that aren't played or only slightly splashed in your playgroups Brawl decks! Of course your playgroup is free to experiment in whatever way you wish with Adventure cards. If you try Brawl Adventures make sure to let me know how it worked and how you played it! For the main game version of this expansion there are 100 Cards - 20 of each color / 60 Quests & 40 Bounties. 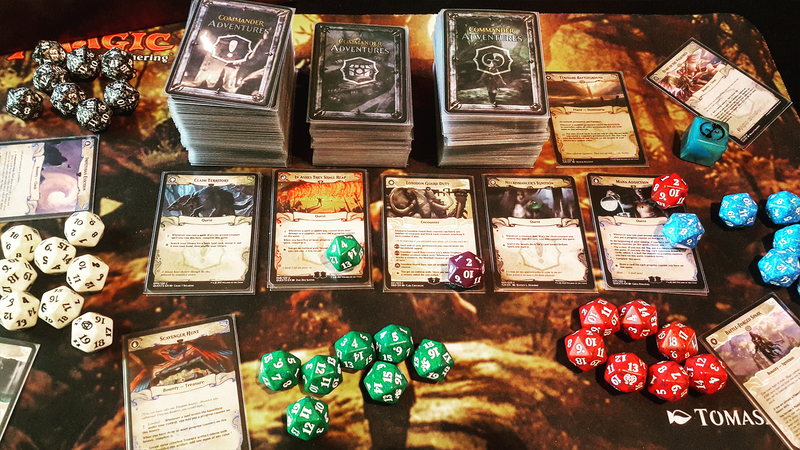 This expansion will also dive deeper into the adventurous board-game theme. 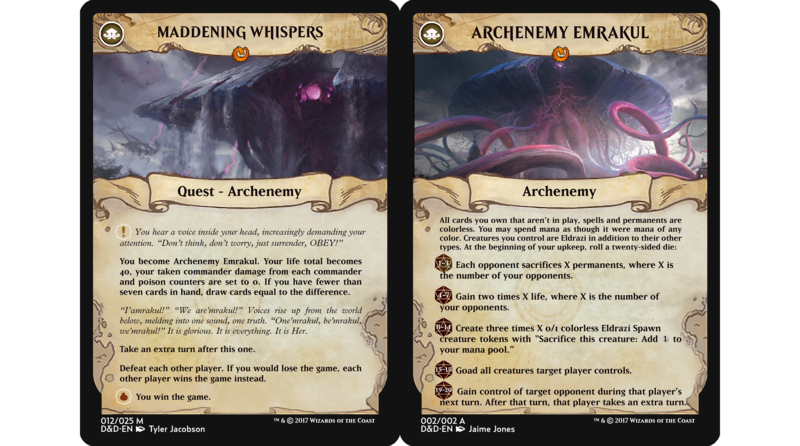 You can either add them to the existing starter edition or exchange quests from the starter edition you don't want to play with quests from this expansion to streamline the gameplay experience for your playgroup! We will move on from color-archetype quests to neutral challenges that are very engaging and need every player to participate. There will be turn-based boss fights (that can kill you! ), new characters, more playgroup-politics and of course tons of rewards! This expansion will introduce Planes to Commander Adventures - The last missing card type for this game! 70 new Planes to explore! 10 new Phenomenons to encounter! Fun-Tipp: You can just use the planes and phenomenons without any other Adventure cards / expansions, too! My playgroup tried it several times. The rules are the same as with official planechase: Every player is able to roll the planar die. Just make sure to keep the Archenemy cards like Sliver Queen and Garruk around! Legacies are our very own version of Commander specific vanguard cards. 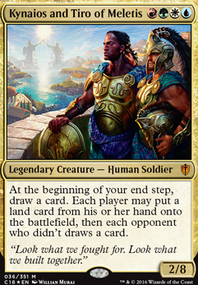 This subvariant can be played without other Commander Adventures sets, similar to Conspiracy! Here are our extremely flavorful and fun Ravnica-themed decks that are perfect to play with Legacy of the Paruns! A small mini-expansion that offers new Common quests. With this expansion we want to offer more variety to how games begin and also add some mechanics that benefit players left in an unfortunate situation of disadvantage aka "bad luck". Since Commander Adventure games begin with five common quests, many CA-players pointed out that they often start with recurring quests. Adding 10 new Common quests to the mixture should bring some fresh air into your games! Delayed to 2019 due to size of project :( But it will be epic, guranteed! This expansion will focus on the Introduction of Sagas (Bounties) and Ballads (Quests). Ballads will affect all players for a complete turncycle and can be of advantage or disadvantage for each player. Ballads can for example planeswalk the whole group to another plane and tell its story and introduce an Archenemy as they resolve. We're planning an encounter, named the Bard, that will planeswalk your playgroup to a town in the Nearheath on Innistrad. The ballad of course tells the story of a sinister invasion. Its your playgroups duty to protect the town from the invasion and prevent its citizens from being turned into zombies! The main mechanics for this event stem from the "Horde magic" variant. But we will of course spice it up with our very own ideas and put in some real challenging encounters and a complete customly designed Horde magic deck! Besides that we added a completely new board game element. While defending the townfolk you have to explore Nearheath and save any villager you find from being turned into a rotting zombie! 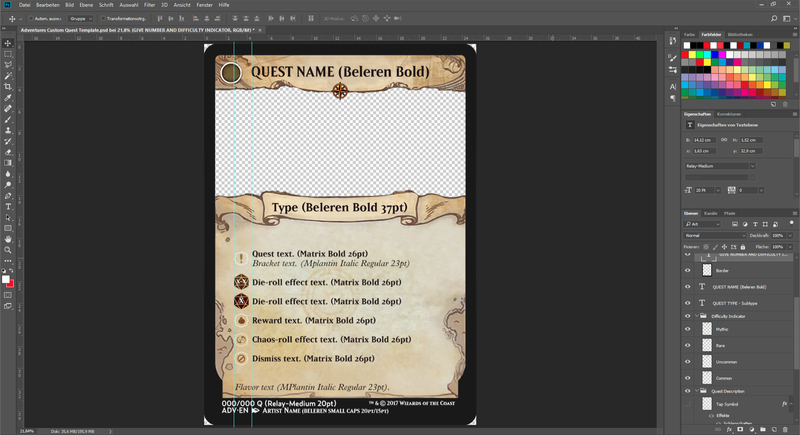 When you have Photoshop you can now download our Template and needed Fonts to create your very own Commander Adventure Quests. You can easily write your own Quest Name and Description, change the Quest Type Indicators (Color, Difficulty) in the Layer-Menu and drop your favorite Artwork behind the quest! You can also create complete expansions and submit them to [email protected] and I will maybe put them up here for all followers of this project! I am really excited to see what you guys come up with! To fully reap the benefits of a quest system I recommend to play more political decks so you can cooperate and interact better with other players in your playgroup and take more time to complete the objectives. The downside of aggressive decks is, that they move the focus from quests to their own decks and that players are forced to deal with them early on, making the games shorter and less focused on Commander Adventures itself. So here is a small list of the decks we play. I will expand this list when I start working on more politic-centric decks. In the Tab below you will find a complete list of well-balanced decks our playgroup uses. 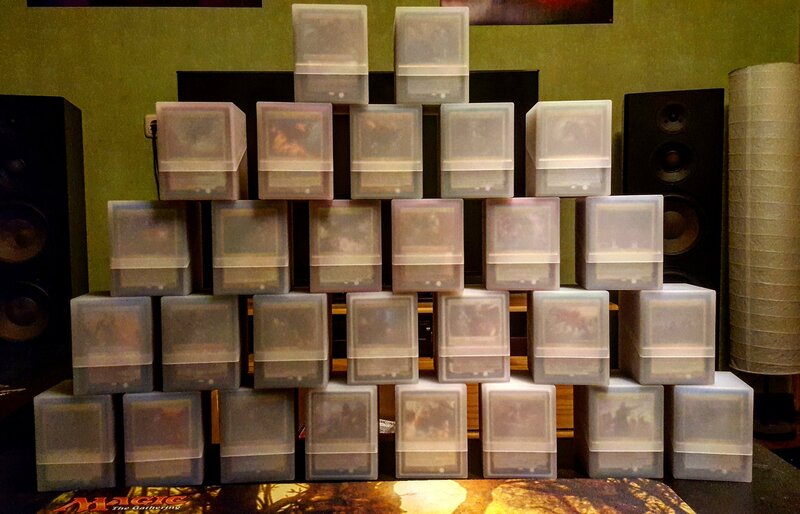 These decks are all made on a budget between 100 Euro and 180 Euro (based on cardmarket.com prices) so everyone should be able to afford these! If you want to create your own PreCon powerlevel deck, check out the guidelines below. 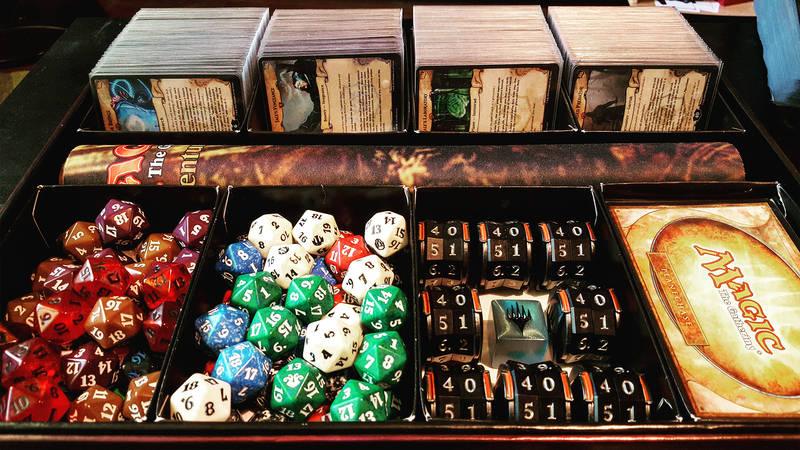 Our playgroup uses these to build engaging, well-balanced and fun decks while not overextending the budget. These also allow for great use of themes in decks that don't see much play in rather competitive environments! Of course you can take these as blueprints and upgrade them according to your preferences! 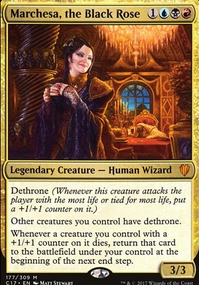 Would be great if other possible Commanders are viable in the deck. Preconstructed Decks often tend to have multiple win conditions evolving around given legendary creatures. Furtherly you won't run into focussing too aggresively on one win condition like most 100%-Power Level decks do. Besides that it's nice to switch the commander sometimes to get another perspective on your deck. 2-3 rare/mythic lands - We usually don't use Shock/Fetch/Alpha/Scry/Check or other expensive dual lands as these quickly increase the price tag of a deck. We use these 3 slots for functional rare lands that work well with the decks theme or tribal. Avoid easy-to-pull-off infinite combs or overpowered singles that make everyone at the table hate you (Looking at you Iona, Shield of Emeria , Craterhoof Behemoth & Cathars' Crusade ) or combs that lock people out from playing the game at all. Of course I recommend to use EDHREC and Scryfall to look up cards, synergies, combs and keywords. I do not own any artworks depicted here. The artworks were taken from various websites and properly credited to the artists at the bottom of each card. I do not have any financial interest in making this set and using these artworks should be seen as advertisement for the respective artists and their amazing work. However, if you own an artwork depicted here and don't want me to use it, notify me and I will remove it. Everything you see here is freely accessible and unofficial. It's just a fan project that my playgroup and I created in admiration for the game and wanted to share. Commander Adventures is not meant for profit in any way. Please refrain from trying to sell any of the designs. Commander Adventures was solely made for personal use at your kitchentable. Magic: The Gathering is TM & © 1993-2018 Wizards of the Coast LLC. This project is neither sponsored nor endorsed by Wizards of the Coast. After contacting WotC Support for an approval request, we were officially given green light to keep this fan project going! In terms of setting up nonprofit online printing options for fans, I am going to check back with WotC at a later point. As of now we will do our best to hold the fan policy guidelines in honor! VERY IMPORTANT: READ DISCLAIMER FIRST! 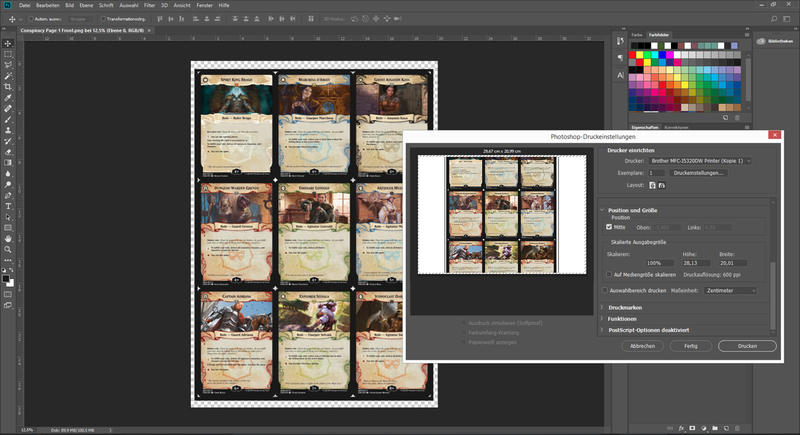 You can download all sheets for printing here including the main game and all released expansions and subvariants! We recommend printing on 300gsm smooth card stock. You can try to order these prints online, but some people reported that they encountered problems with some services since the cards show trademarked artworks and such. Sometimes it helps to link this project to these services so they can see that the cards are nonofficial and only for private use! Again: We urge everyone not to use anything from this project commercially! 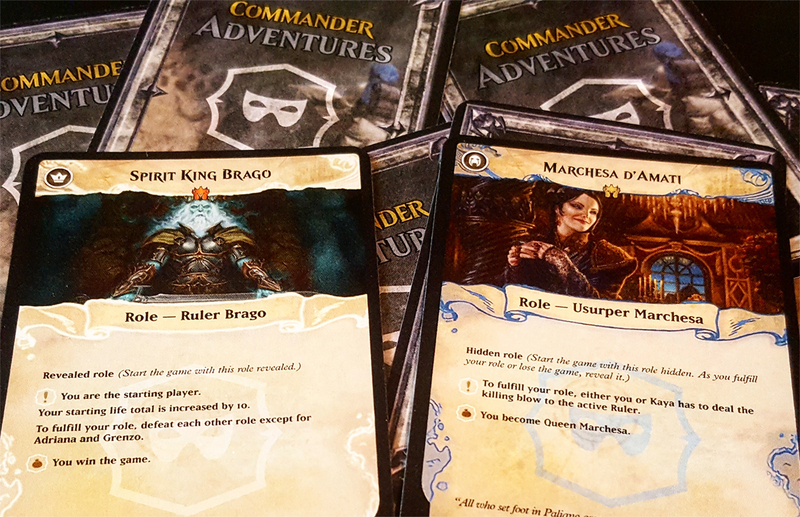 Commander Adventures is only meant to be played with friends at home or in your Local Gaming Store! Please comment below if any download links are broken. Some may be down for 24h if the download traffic is exceeded. You may try another mirror or use the link next day. Card sizes are 100% correct for 6,3cm x 8,8cm. There are also print sheets for the Card Backs so you have an easier time keeping them separated. If you don't have access to Photoshop for exact printing get a freeware like GIMP or visit your local print shop! We will design both, general and "Commander Adventures"-specific Achievement Point System cards so you can use this system even without playing CA! You like the Adventure format? Add it to your favorites, spread the word and check back for updates! Update 11/02/2017: Release Version 1.1: I tweaked some quests: KING OF THE CASTLE reward got slightly nerfed, KNOWLEDGE IS POWER reward got buffed, SURVIVAL OF THE FITTEST reward got buffed, I WILL BE BACK quest is now slightly easier, SPELLSLINGER quest is now slightly easier, SELFLESS INTERVENTION quest is now slightly easier / wording was corrected, DECEITFUL MONARCH quest is now slightly easier, SAVAGE APPETITE quest is now slightly easier, CALL TO ARMS quest is now slightly easier, TASTE YOUR OWN MEDICINE got its wording optimized. Many thanks to reddit.com/user/thinkforgetfull and his playgroup for the great feedback!! Update 11/11/2017: We hit 11500 Views and 180 Upvotes! Thanks for spreading this idea! Please keep reporting how it worked for your playgroup and if you ran into any troubles. Update 11/18/2017: Release Version 1.2: Some minor wording corrections! Thanks to AstrisJanus for the suggestions!. EMBRACE CHAOS has its penalty nerfed (as suggested by ofekon11), BLOODLETTING is now slightly easier, CORPSE RECYCLING is now slightly easier, FERTILIZE is now slightly easier, THE BEAST WITHIN is now slightly easier, LORD OF THE RINGS is now slightly easier. Hope that will speed up the pace for some playgroups! 1.2 will be the last update for the starter edition (except if there are any important hotfixes needed) - Work on the first expansion "Dungeons and Dragons" has begun! Update 11/22/2017: The long awaited Archenemy Quests are in! 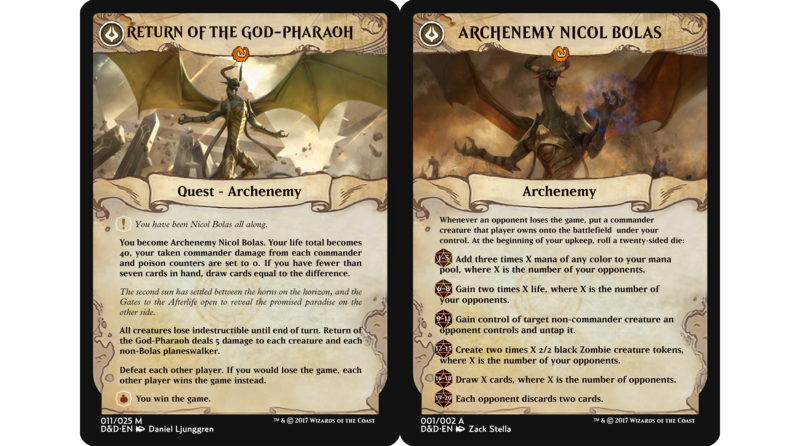 Introducing Archenemy Nicol Bolas and Archenemy Emrakul! Excited to see how they work out! If everything goes well the test version of "Dungeons and Dragons" will be ready next week Friday! Update 11/23/2017: Just a minor update today: The Treasure Goblin! Thought would be funny to have a small Diablo reference here :) If you have any quest suggestions post them in the comments below - I will consider every suggestion! Update 11/27/2017: Dungeons and Dragons Testversion done! Download Links download Tab! Happy for any feedbacks and corrections! Release is scheduled for next weekend! Update 11/28/2017: Just added a small expansion for Commander / Commander Adventures: Conspiracy! Check the Quest Tab! Update 12/03/2017: Final overhaul for Starter Edition, D&D Expansion and Conspiracy Expansion done! Thanks for all support and suggestions! Will finish a small rulebook next and start working on a small YouTube series covering the idea, background and rules for Commander Adventures! Update 12/04/2017: Added the rulesheets for printing! Update 12/10/2017: Added the first planes and phenomenons, as well as ignition quests! Renamed reward quests to bounty quests! Update 12/13/2017: Added the first main villain: Garruk, Cursed Predator. He will only spawn on some planes. You can either flee or try to confront him. Update 12/30/2017: The official Commander Adventures Introduction video is up on our YouTube Channel! Update 01/05/2018: HOTFIXES: The following quests had just minor wording changes (just some effects that said "get /keyword/" to "gain /keyword/"). Since these are Synonyms they don't affect gameplay in any way, wanted them just to be as original as possible (Thanks to Fatred for pointing these out). 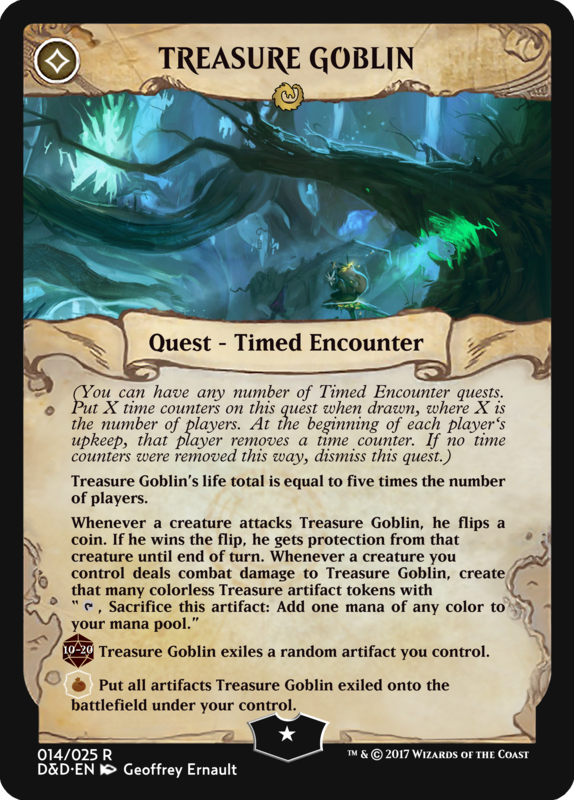 If you already printed Commander Adventures I advise to add these single quest to your Ignition print if you want to get the updated versions. Sorry for any circumstances! Update 02/12/2018: Added new Planes and a mythic Open Quest as well as a mythic Bounty Quest! Ignition expansion and our new Website should be finished around first week of March! Update 03/31/2018: The design for all 110 new cards including new Tokens is finished! Our judges will review every single cards for wording optimization and spell checks prior to release! Check out our previews in the Ignition Tab and tell us what you think! Big THANKS to our Patrons!